(L to R) Distinguished Professor Steve Grimes (OHIO), Sean Liddick (NSCL/Michigan State University), Alexander Voinov (OHIO), Therese Renstrom (University of Oslo), Tom Massey (OHIO), Artemis Spyrou (Michigan State University), Panagiotis Gastis (Central Michigan University), Darren Bleuel (Lawrence Livermore National Lab), Ann-Cecilie Larsen (University of Oslo), Stelios Nikas (Central Michigan University). The control room is where all operations on the accelerator and beam lines are monitored and carried out. Photo credit: Jean Andrews/Ohio University. 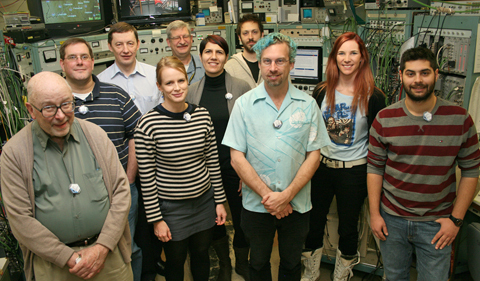 This past week, physicists from the University of Oslo (Norway), Michigan State University, Central Michigan University, and Lawrence Livermore National Laboratory met with OHIO research personnel and graduate students at the Edwards Accelerator Lab to conduct experiments to observe nuclear reaction pathways for making heavier elements. Ohio University’s Edwards Accelerator Lab is a very special place. The lab is one of the few facilities in the world with specially designed equipment allowing researchers to conduct experiments to better understand sub-atomic phenomena such as the relative temperature of a nucleus. The collaboration with members of Ohio University’s Institute of Nuclear and Particle Physics included sharing techniques and experiment results that will help to predict and calculate what is contained in the nucleus of an atom. Studying the behavior of the level density as a function of the atomic number allows researchers to calculate reactions of interest to the field of nuclear astrophysics. “Learning more about nuclear quantity helps physicists to understand nuclear structure properties and to constrain reaction cross sections important for nuclear astrophysics and technology,” says Dr. Alexander Voinov, Research Assistant Professor of Physics & Astronomy at Ohio University, and the group’s host. The experiment involved studying the level density of the Ge-76 nucleus. Ge-76 is a naturally occurring isotope of the chemical germanium. A beam of the chemical Lithum-7 was used to hit a target of zinc-70. The scientists then observed subatomic particles to determine the nuclear level densities that are relative to temperature. One of the objectives was to measure the cross section of outgoing protons to see how often the reaction occurs. The specialized equipment at the Edwards Accelerator Lab is designed to conduct up to a dozen energy time-of-flight measurements simultaneously, making the process highly efficient—a huge plus for researchers. And by conducting these kinds of experiments, they are better able to calculate and predict what comes out of the nucleus of an atom. 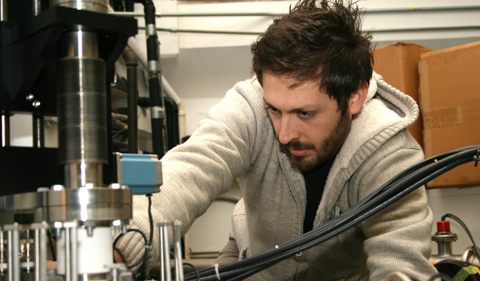 Panagiotis Gastis (Central Michigan University) checks the target position in the experiment chamber in the Edwards Accelerator Lab. 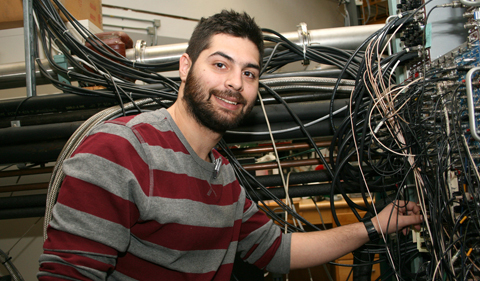 Stelios Nikas (Central Michigan University) at the electronics panel where signals are processed. 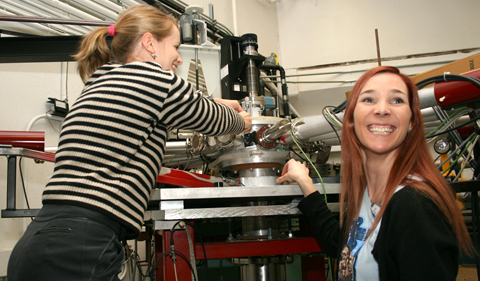 University of Oslo physicists Therese Renstrom and Ann-Cecilie Larsen check the time-of-flight energy chamber containing the target and silicon detectors. 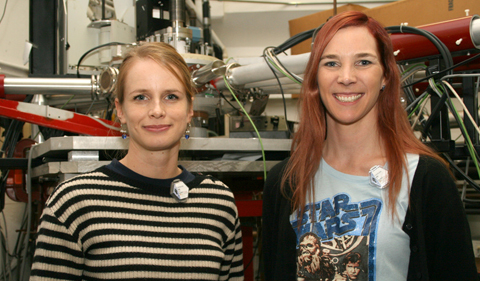 “This is my fourth time visiting the Lab to conduct experiments since 2006,” says Ann-Cecilie Larsen (right) pictured with colleague Therese Renstrom from the University of Oslo. Larsen was a guest seminar speaker for Ohio University’s Institute of Nuclear and Particle Physics during her visit. 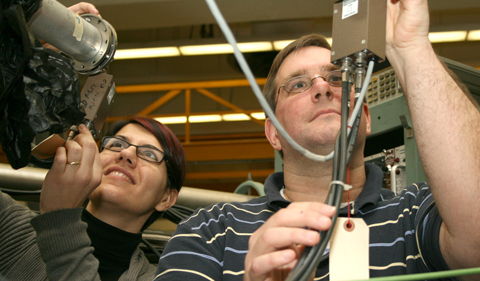 Michigan State University physicists Artemis Spyrou and Sean Liddick work on the electronics for the silicon detector. 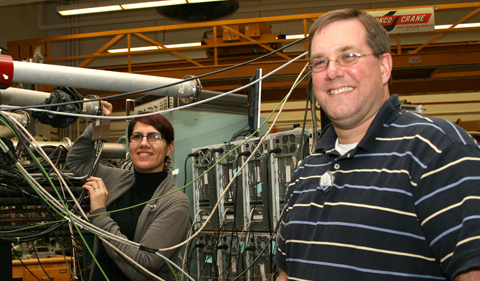 Spyrou and Liddick stand near the 16 computers used to collect data. 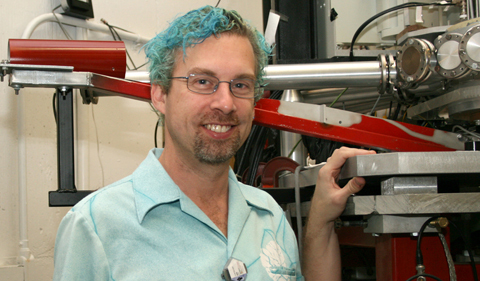 Lawrence Livermore National Lab physicist Darren Bleuel holds a silicon detector used to detect charged particles.